This file contains a poster to help describe the "glow and grow" assessment strategy to your students. Students use a yellow highlighter (glow) to show on their work where they have met or exceeded expectations. 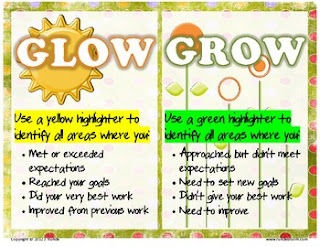 They use a green highlighter to show where they need to "grow" in their work. The file also contains two handouts (one for self/teacher assessment, and one for self/peer assessment) where they describe what they have selected for glow and grow. This assessment strategy can be used for any subject area.